quirky horror title by the name of Illbleed being one of them. 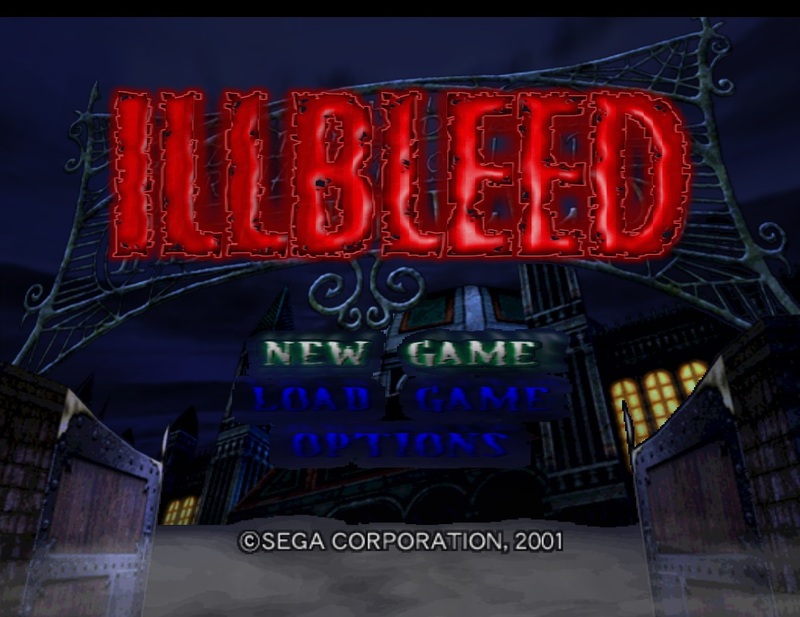 While there were a few horror related games that graced the Dreamcast, Illbleed holds a cult status and mostly with good reason. The game begins in the shoes of Eriko Christy, the president of the horror movie club at her high school, where she and the rest of her club end up with tickets to “Illbleed”, a terror-filled theme park where, if someone can make it through the park and survive, they can win $1,000,000,000 dollars. Of course, Eriko and her friends- the cool guy, Kevin, the jock, Randy, and the paranormal fan, Michel- all decide to take advantage of this to meet at the park and get through it together. Eriko, being the good friend that she is, arrives at the park late and finds that her friends have disappeared into the park under mysterious and perilous circumstances. Now, she must go into the park to help her friends and escape. The park is split into five ‘stations’, each with their own brand of horror- in one, a mischievous doll makes you perform tasks at her whim to pass while another centers around a park being terrorized by giant worms- and each has one of your friends trapped at the hands of the monsters within. In each stage, you can save your friends, adding them to the playable cast and saving them from terrible death. Should you not reach them in time or not act accordingly- well, it shouldn’t take much imagination to figure out the conclusion to that. You can also help a reporter, Jorg, who is investigating the park and murders that are happening within, rounding out your cast. As you travel through the levels, you have three bars to look after. Your standard damage bar will lower as you are struck by monsters or lured into harmful traps. There is also a heart rate bar which can be raised by running and dodging too much or by finding spooky traps. Should this raise too high, there is the possibility that your character can die of fright. Thankfully, your heart rate lowers as you stand still. The last is the hardest to gauge, as it is a bleeding gauge. Certain traps and enemies can ‘cut’ the character, and if they are bleeding too much without it being taken care of, it can also eventually lead to their deaths. Thankfully, there are plenty of ways to avoid all of these things throughout the game, including a sensor that helps you detect traps. The tone of the game is its highest selling point. This is B-Movie corn from beginning to end (twice, as there is a New Gam e Plus), and it references numerous movies, including Toy Story and Tremors. While one stage plays out like a murder mystery where you guess who is killing maintenance people at the park, another has you finding clues about the mysterious death of a young boy and his father. None of this is played terribly straight, so this is more cheese and less scares, but it is enjoyable and feels like it is in the same vein as game like Monster Madness and Zombies Ate My Neighbors. The other bonus to this game is that it is rarely boring. Save for one level that felt a little longer than necessary (in which you are transformed into a wooden puppet), none of the gimmicks feel invasive to the entertainment value of the game. Each level feel incredibly unique, and the different characters play just a bit differently than one another, even having different strengths and weaknesses. For instance, Michel can handle more scares than Randy, but in a fight, Randy can dish out and take more than Michel. There is a lot of variety to the game and its components. In that variety, however, looms some dark shadows regarding controls and gameplay. Movement-wise, there are some small quirks to overcome, but nothing like some of the more unwieldy games of the time. Combat is a little wonky, and sometimes, when you need a precise movement- one sequence involving jumping from car to car comes to mind- your character will take an extra step to ‘center’ their stance, which can lead to untimely lost health. Thankfully, this usually results in lost health rather than the life of your teenager. The other issue is that there is a severe lack of in-game tutorial unless it involves the specifics of levels. In turn, this means that certain concepts like the special gadgets for sensing traps go unnoticed unless you stumble across them. In the days where manuals are mostly lost or nonexistent, this can cause some unnecessary hassles in even some of the easiest levels. Graphically and musically, the game is fairly dead on with what it is aiming for, if not obviously a sign of the times with some of the blockiness of the actual movement of figures. Each of the levels is book-ended by gloriously illustrated synopsis sequences, and the soundtrack is full of goofy Scooby Doo type tracks. If you were ever looking for a perfect example of the Dreamcast’s usual fare, this would be it, for better or worse. If you’re a horror fan, movie fan, or generally a fan of fun adventure games, Illbleed is a good choice to add to your repertoire. The Dreamcast played host to a bevy of neat adventure games that didn’t get a chance, and this game is a lost gem, if not showing some of its signs of age at this point. While it was left open to a sequel that never came and the New Game plus is pretty much an excuse to get the heroine wearing next to nothing, at its base, Illbleed is a solid homage to horror movies and gaming of yesteryear, if you can track down a way to experience it.